CNN recently published an op-ed piece by Chris Taylor and Anthony Zinni, “Military needs response plan to genocide.” In it, Taylor and Zinni outline the need for a standard military doctrine to guide responses to genocide and mass atrocities. Such events present significant challenges for which most military forces are unprepared since civilian protection differs from more common conventional warfare and counter-terrorism operations. 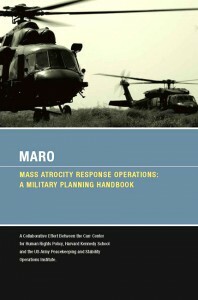 The unique complexity of genocide and mass atrocities is what prompted the Carr Center for Human Rights Policy at the Harvard-Kennedy School to initiate the Mass Atrocity Response Operations (MARO) Project. The goal of MARO is to inform the planning of “a contingency operation to halt the widespread and systematic use of violence by state or non-state armed groups against non-combatants.” While this is not yet an official part of military doctrine, the goal of the project is to make this a reality not only for the United States military but also for other armed forces around the world. This global focus is aided by the collaboration of Canadian Senator Romeo Dallaire on the project. The MARO Project seeks to inform military forces on how to intervene to stop genocide and mass atrocities. MARO is a concept that has been long in coming and contains useful information not only for military forces involved in stopping genocide but also for other organizations that aim to support or carry out their own genocide prevention efforts. Of particular interest for the Sentinel Project is an annex to the document regarding the intelligence requirements of genocide prevention and intervention, which has obvious relevance to our own work. The full document is available on the MARO Project website (linked above) and anyone involved or interested in this field is strongly encouraged to read it.